I just want to start by saying that these pictures from our weekend are seriously so lame, and I don't want to be judged. We had a very good, and lazy weekend. Besides working out, we watched a lot of movies, and just chilled on the couch. I am totally ok with it though, because I think we totally needed it! Then we showered and actually got ready for the night, and went out to dinner on a lil date. It was a very nice, beautiful weekend. Last week, after my party, I didn't have a lot of groceries to make dinner, so we had a lot of eggs and toast, pasta, and went out. 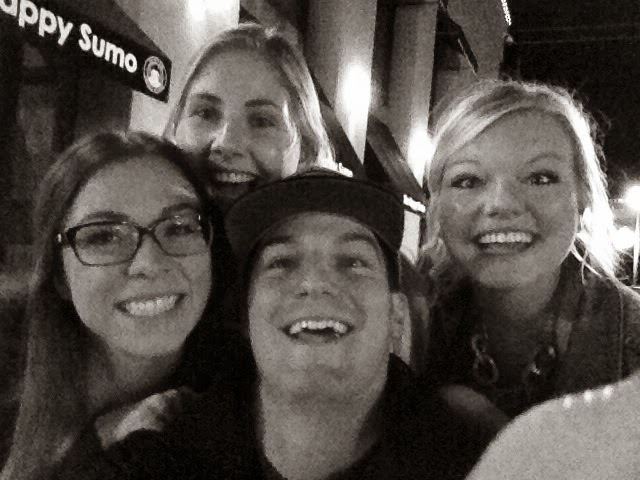 One night last week we went to Happy Sumo for VIP night with Shelley and Em. We always have a blast with those two, and we are glad Tanner is just "one of the girls"...I'm gonna get punched for that! :) I love the Riverwoods, and it is seriously so fun to walk around when it's a beautiful (almost Spring!) night. Saturday I went for a little run in our neighborhood, and was scared I was going to get lost, because usually I just follow Tanner. But, I got back to my house successfully! Then, I enjoyed doing some funny workouts in my backyard, and just laying there, enjoying the sunny breeze. On Sunday, we lost an hour of sleep, thanks to Daylight Savings, or whatever it's called. It's seriously the weirdest feeling. But, that means the nights will start being bright until 9, and I can hardly wait! We enjoyed a seriously awesome Stake Conference. In our ward boundaries, we can pick from a family ward, or a young student married ward. We wanted to meet other couples, so we are in an awesome married ward, in an awesome stake. The talks were so wonderful, and we went away learning so much about marriage, communicating, and just loving each other. I really love hearing other couples' love stories, especially if they've been married for 30 something years! We drove with the windows down enjoying the sun, and wearing my glasses. Monday night was of course, the Bachelor final rose episode. It has been tradition for the last maybe 5 episodes to watch it with our new friends Seth & Stephanie. Tanner new Seth from football at BYU, and it was such a coincidence that we were in the same ward. Our husbands didn't think their wives would get along, haha but we totally do, and I love them! And, what is Bachelor, without treats!? The finale deserves its own post, but maybe not. -I liked how Nikki said that she's ok with him not telling her that he loves her, if he doesn't know for sure. I respect that. -And, that was great of Juan Pablo to respect her dads wishes. BUT He was down right rude to Clare...and I was always a Nikki fan, until the final episode. I just didn't like how he treated her. -The After the Rose ceremony was hilarious, and so awkward, and all of us were hiding behind pillows. Some people were bashing on Chris Harrison, but I thought Juan Pablo was SO rude to him, and Chris is just great, and handled it perfectly! -I'm always glad when they're done because that means less drama and making out scenes in my life. But, I have watched every season except for one...so I guess I'm an addict. This week has been hard to focus on, because Tanner has two huge tests, and we are leaving on Thursday for Arizona. It's hard to not be so excited to get outta herreeeee! Oh, and it snowed today.